Nov. 1, 2013, 9:57 a.m.
A report from Knight Foundation finds that nonprofit news sites are growing revenues and audiences, but finding the path to long-term success will take more experimentation. By Justin Ellis @JustinNXT Nov. 1, 2013, 9:57 a.m.
What, exactly, does a healthy nonprofit news site look like? If you’re a national site like ProPublica, is the metric winning major awards and changing policy through your reporting? If you’re a state-focused site like The Texas Tribune, does success mean increasing traffic and diversifying revenue through events? Or if you’re a local site like Voice of San Diego, is it improving the membership experience of your core audience? A new report this week from the Knight Foundation (disclosure: a funder of Nieman Lab) took a look at the state of play of 18 nonprofit news organizations around the country to find out how they run their business, how they produce their journalism, and how they connect with their communities. Analyzing finances, online traffic, and other audience data, the report found that the overall story is a good one: Revenue is up, business models are being diversified, and audiences are growing. But that success is not without some uncertainty. Even as nonprofit news outlets find new ways of generating revenue, most dedicate less of their staff to business operations and development than the editorial side, according to the report. Similarly, the report found that many organizations are not dedicating enough resources to the kinds of technologies that will help them adapt to further changes in journalism. The conclusion, similar to a study from the Pew Research Center earlier this year, is that plans for long-term sustainability remain elusive. In total, the report is a kind of nonprofit news playbook that offers insights into how 18 organizations of different sizes and scopes are managing operations. But Knight also offers some prescriptions, like establishing partnerships in a community, increasing revenue diversity, refining metrics for success, and expanding into areas beyond content production. This follows up on a discussion Knight and the Pew Research Center held in September on measuring impact, sustainability, and scaling issues. The 18 organizations that participated in the study are a familiar list of names: ProPublica, The Texas Tribune, MinnPost, Voice of San Diego, The New Haven Independent, The Lens, and Oakland Local among others. Many of the outlets have received some kind of funding from Knight in the last several years, either in their startup phase or in support of specific projects. “One of the things we were looking at and wanted to see, there is a sense that the [nonprofits] that made it and survived, how can we help them rethink and refine what they’re doing,” said Maness. Total revenue created by the outlets surveyed by Knight increased by almost 30 percent over the last three years, and the majority recorded a surplus last year. In that time, most of the organizations have also decreased their reliance on foundation funding, dropping from 65 percent of total revenue in 2010 to 50 percent in 2013, by growing earned revenue through advertising, events, and sponsorships. VT Digger, for example, increased its earned revenue to 42 percent in 2012 from 8 percent in 2010 through corporate sponsorships. Others, like the New England Center for Investigative Reporting, are having success with journalism training programs as a form of revenue, generating $176,007 in 2012, up from $53,355 in 2010. 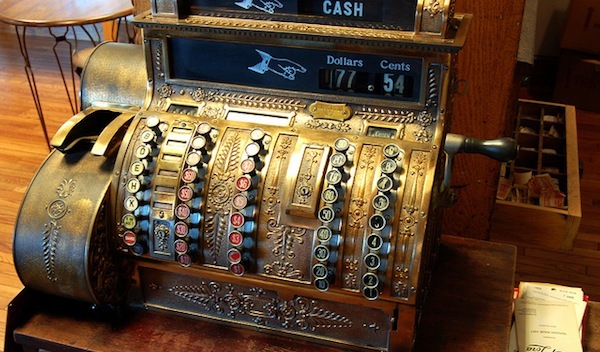 But the revenue picture alters slightly depending on the size and scope of the organization. Knight broke down the nonprofits it surveyed into three groups: local, state, and investigative. 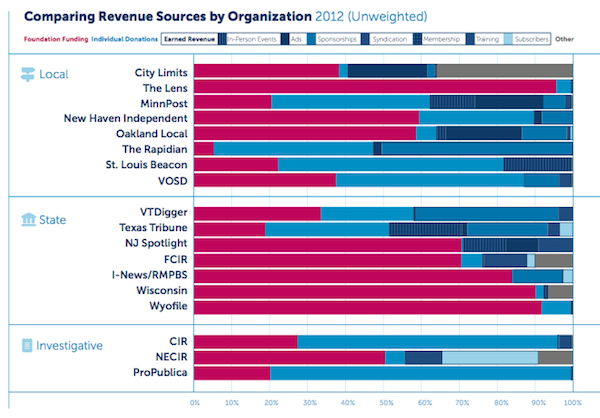 While reliance on foundations is decreasing, those dollars still make up the majority of revenue for smaller outlets like New Haven Independent, Oakland Local, Wyofile, NJ Spotlight, and Wisconsin Watch. For some organizations, like ProPublica and the Center for Investigative Reporting, more than 60 percent of their revenue comes from individual donors. That difference in size was also evident in the budget and expenditures of the nonprofit outlets. According to Knight, sites with a national focus like ProPublica and CIR have expenditures over $9 million annually, while places like The Rapidian and Oakland local have less than $150,000. 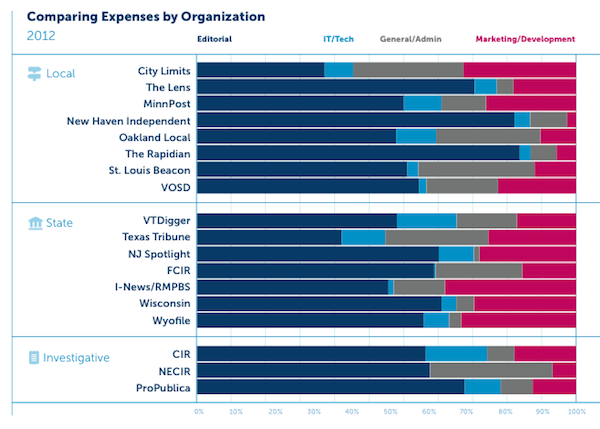 Though the larger, investigative nonprofits spent the most on technology, it was the state-focused organizations that spent the most on marketing and business development. But those totals are still relatively small compared to spending on the editorial side. While there’s a difference in scale between the larger, investigative outlets and the smaller, local sites, Maness said they share commonalities in the ways they identify audiences, pursue outreach, and meet the needs of that community. More importantly, Maness said all the nonprofits face the challenge of finding ways to experiment with new lines of business and new methods of distribution and engagement. The report found that web traffic, social media engagement, and other outreach like email newsletters is growing, but most of the organizations are searching for better metrics to understand their audience. And with mobile traffic rising, most of the outlets do not have mobile sites or apps to meet the needs of users, according to report. In order to continue their pace of growth, the nonprofits will have to dedicate more resources to technology and the business side, said Mayur Patel, vice president for strategy & assessment for Knight. One reason nonprofits need to move beyond foundation funding is that those dollars often come with strings attached, either for specific reporting or projects. A diversity of funding means more flexibility in budgeting and experimentation, Patel said. Patel said that the way we think about sustainability needs to change. The simplistic view of sustainability is looking solely at finances, rather than whether an organization is meeting its broader goals outside of money. That could be looking at what kind of social impact does your journalism have, and whether you investing in projects that have a lasting connection to a community, he said. Image by Taber Andrew Bain used under a Creative Commons license. POSTED Nov. 1, 2013, 9:57 a.m.
Ellis, Justin. "What does sustainability look like in nonprofit journalism?." Nieman Journalism Lab. Nieman Foundation for Journalism at Harvard, 1 Nov. 2013. Web. 20 Apr. 2019. Ellis, Justin. "What does sustainability look like in nonprofit journalism?." Nieman Journalism Lab. Last modified November 1, 2013. Accessed April 20, 2019. https://www.niemanlab.org/2013/11/what-does-sustainability-look-like-in-nonprofit-journalism/. | title = What does sustainability look like in nonprofit journalism?